I've passed this cemetery at least 100 times in my life and it always amazes me. It's huge. 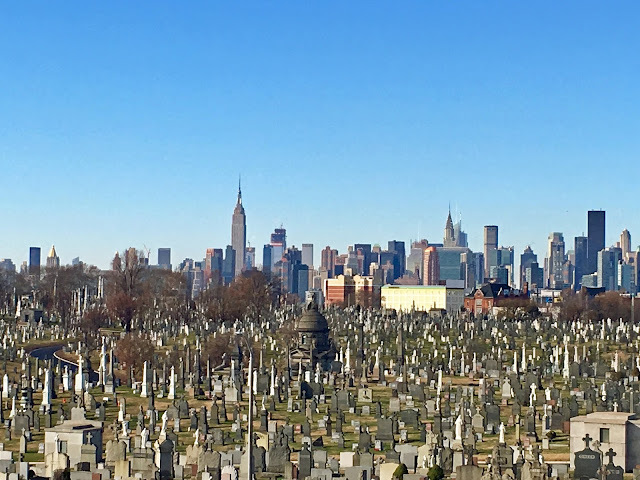 To see the vast expanse of the cemetery with the Manhattan skyline in the background is quite a sight. You can get a pretty good view from the Brooklyn-Queens Expressway, it just goes by too fast. Well, unless you're stuck in traffic. I'd love to visit one day and walk among the headstones. From Wikipedia: The Calvary Cemetery covers 365 acres and has about 3 million burials, the largest number of interments of any cemetery in the United States. Established in 1848, it's also one of the oldest cemeteries in the United States. The cemetery is divided into four sections, spread across the neighborhoods of Maspeth and Woodside, Queens. The oldest, First Calvary, is also called "Old Calvary." The Second, Third and Fourth sections are all considered part of "New Calvary." By 1852 there were 50 burials a day, half of them poor Irish under seven years of age. In the early 20th century, influenza and tuberculosis epidemics caused a shortage of gravediggers, and people dug graves for their own loved ones. The entire number of interments from the cemetery's opening in August 1848 until January 1898, was 644,761. From January 1898 until 1907 there were about 200,000 interments, thus yielding roughly 850,000 interments at Calvary Cemetery by 1907. At more than 3 million strong, they're still accepting customers. I've always been in awe when you get to that point on the LIE where the cemetery is on both sides of the road. As you say, it's huge.